The Fountains rung in 2019 by throwing an unforgettable celebration. On New Year’s Eve, the Key West Auditorium was transformed into a magnificent party atmosphere. Sparkling lights and festive decorations lit up the night of December 31st. The doors opened at 7:00pm and the room was soon filled with music, laughter and merriment. Adorned with fun party favors and beautiful holiday outfits, the residents danced and celebrated well into the night. The entertainment was provided by the sensational “Second Wind Band”. The band featured eight extremely talented jazz musicians. Their swinging jazz sounds and foot tapping rhythms got people up and moving. Many residents graced the dance floor to show off their dancing skills. As the Traditional Jazz band performed, residents snacked on hors d’oeuvres and enjoyed the open bar. The shrimp cocktail tower was a huge hit, as well as the the assortment of delectable desserts. As the night came to an end and as everyone said their last farewells to 2018, the countdown to the new year began. 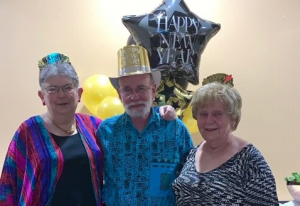 Just as the giant New Years Eve Clock read midnight and the room filled with a loud “Happy New Year!” Residents welcomed in 2019 with a champagne toast while surrounded by wonderful music, warm wishes and great friends.